I took a little detour last month from my beauty boxes obsession and subscribed to the Lucky Dip Club. A lot of people have come accustomed to the beauty box experience and the Lucky Dip Club works in a similar vein, you subscribe and a box of surprise goodies gets delivered to your door. 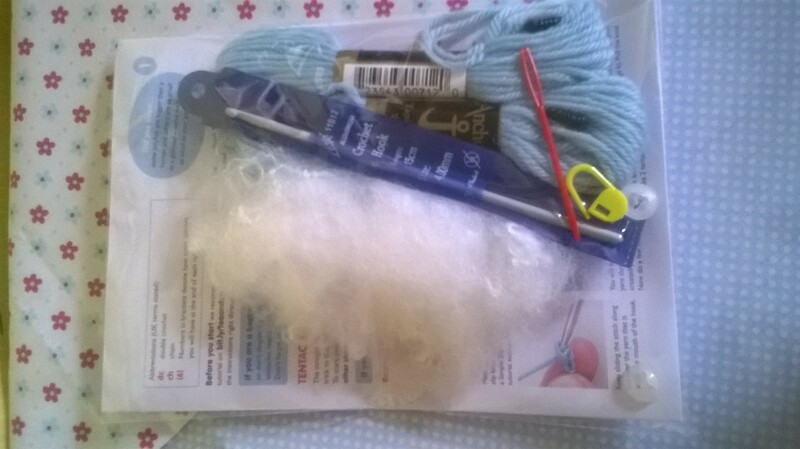 The difference is that instead of sending beauty products The Lucky Dip Club sends you handmade, unique designs in the form of jewellery, stationery and other gorgeous accessories, you also get a craft kit so you can feed your own creative side. If all of that loveliness wasn’t enough you receive one personalised item in your box every month and you can choose what word/name/initial you would like to have personalised. Each piece in your box is lovingly created by very talented designers and is unique to the Lucky Dip Club and every month there is a new theme. 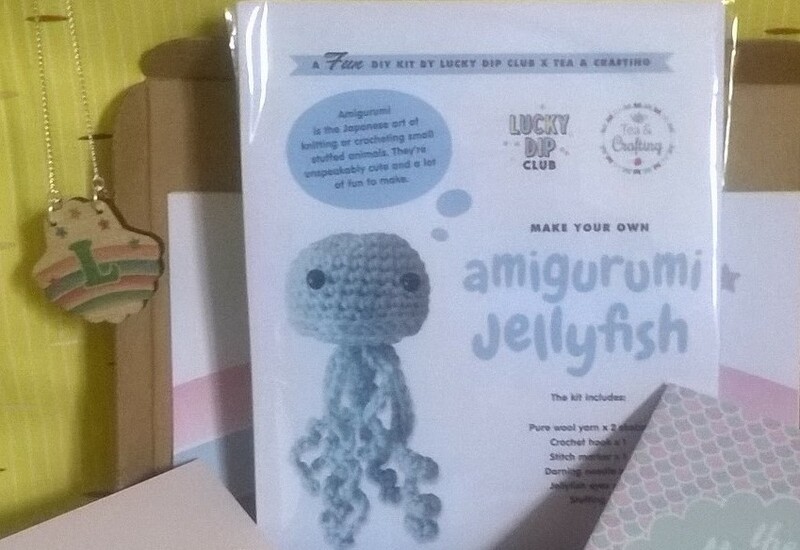 I have heard about the Lucky Dip Club online and in craft magazines and I have wanted to try it for a while but the boxes sell-out fast to first-time subscribers or one-off purchasers. Subscriptions open the first day of the month from 7 am and sell-out by midday. I fortunately managed to subscribe last month after trying for a couple of months (I kept forgetting the date – damn fibro fog!). As the boxes are full of handcrafted goodies and the items are made to order you receive your box near to the end of the month. My first box (July’s box) arrived a little over two weeks ago and I couldn’t have been more chuffed with it. The Lucky Dip Box was a giddy ray of sunshine in what has been a bleak few months health wise and anyone who is or has ever been housebound knows how exciting and important parcels become to lifting the monotony. However, a box has not seem this exciting since I was 8 and spent the whole summer playing in a spaceship that I made from a cardboard box that came with our new freezer. Creativity equals joy at any age and in any circumstances and joy is exactly what you get packaged in the box. That childhood playfulness and awe of bright colours and pretty things is what the Lucky Dip Club relishes in. Seahorse acrylic brooch – love it! 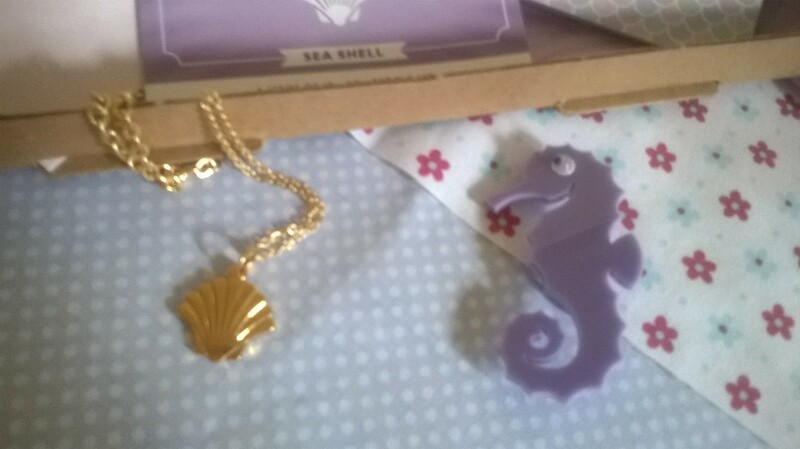 I have thing for seahorses anyway. 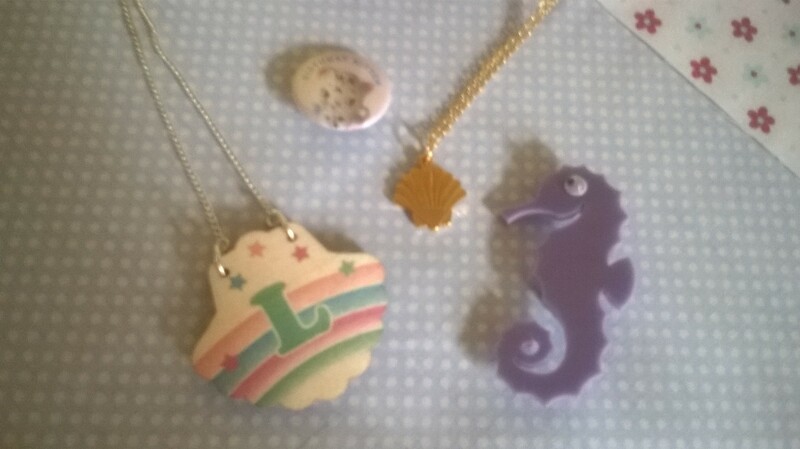 Shell necklace with rainbow pattern and personalised with an ‘L’ – so cute. Notebook – can never have too many. Gold shell charm necklace that also came with a bracelet chain – so pretty and versatile, small enough to layer up yet big enough to be seen. 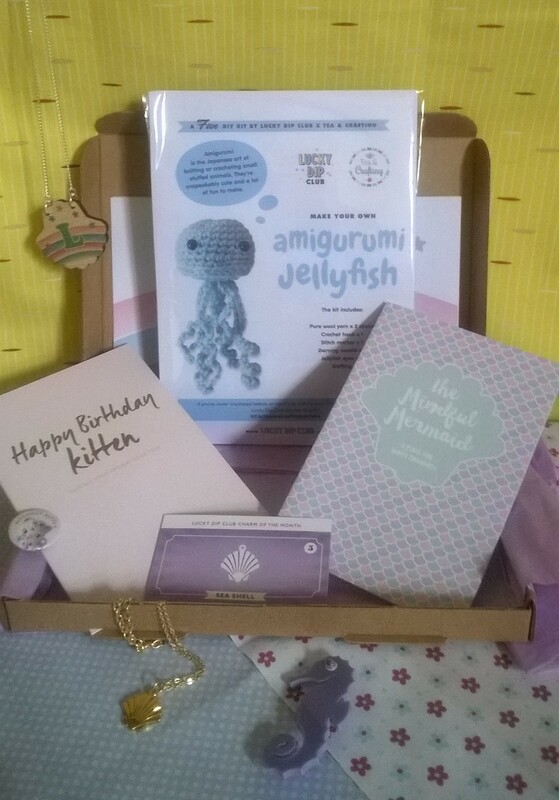 Amigurami Jellyfish Crochet kit – The jellyfish is adorable and the kit comes with everything you need to make him. Bonus: As July was my birthday month I was sent a hand signed card and a very cute birthday kitten badge and a little bag of confetti. I’m so in love with the Lucky Dip Club. It’s £18 pounds subscribed or £20 one-off and is delivered free in The U.K.